A lot has changed in five years for our favorite characters, but one thing hasn't: They just can't stop lying. On Pretty Little Liars Season 6 Episode 12, Aria had to get the girls to lie for her in order to stay well out of the frame for Charlotte's murder, but if the girls can't stop lying for each other, they're never really going to have a drama-free life. There's no denying that Aria and Ezra look very guilty right now. The flashbacks can be discounted because on this show, they can change in instant when told from someone else's perspective. Aria has a perfectly good excuse for meeting him. Her boss can back her up on that. Although meeting in the dead of night won't do her any favors, if she genuinely was innocent, she'd have learned from her mistakes by now. Nothing good ever comes from lying and they're leaving the door very much open for a new A to rise and start exposing their ever-growing list of secrets. Props to Hanna for saying it like it is. Aria may have been able to deflect her actions five years ago, but this new and improved Hanna has a no-BS filter and that's why she never gave up in her pursuit of the truth from that night. I know she's protecting Aria, but she should not have deleted that footage. We all know that the police are going to come sniffing around the hotel for the footage eventually, so it's a little too convenient that parts of it are gone. Chances are there will be at least one more copy and the gals are going to have a lot of explaining to do. Emily: What do we do? Do we erase the video? Hanna: We're not in high school anymore Emily. We're going to talk to Aria. Permalink: We're not in high school anymore Emily. We're going to talk to Aria. Hanna has a lot of explaining to do already because this Jordan character just isn't cutting it. He seems so full of himself that he was difficult to like. I don't know if it's down to the dude's acting or what, but he just doesn't seem to be a decent enough character. I can't wait until he packs his bags and leaves Rosewood. That's not to say I want Haleb back together just yet. There's something going on with Caleb and Spencer and that needs to be explored before we see any reunion go down. It's not very often the Pretty Little Liars producers are honest in interviews, but they hit the nail on the head when they said that Emily would be the most changed character after the time jump. Shay Mitchell is being given her best material yet, and it's not often that happens for actors when they're six years into a role. I do hope that she stays friends with the manager from The Brew. Hopefully she's learned from her mistakes of jumping into relationships with people she barely knows. The scene with her at her father's grave was heartbreaking. Losing a loved one is never easy, and even though it's been a while since her father died, she's still not fully grieved and needs to do that in order to move on. It was odd that Shower Harvey showed up at the cemetery. They really need to get rid of that chick right away. Sure, she's the new "Jenna thing," but she's pretty annoying. She's probably one of the worst characters in the show's history. "Charlotte's Web" was a cut above Pretty Little Liars Season 6 Episode 11. There wasn't as much filler as we normally get in a post-premiere episode. It seems the new mystery has really given the show a new lease on life. At least for now. What really happened to Nicole? It's doubtful that Ezra had anything to do with it, but does he think Charlotte did? Caleb and Spencer. Are they or aren't they? We need to know. That closing scene with Alison wasn't all that shocking, but does anyone think Lorenzo could be in on Charlotte's murder? 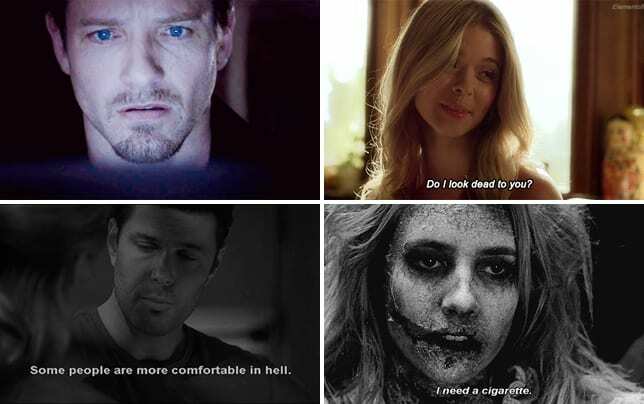 He did briefly date Alison for a while. Look how that turned out. Spencer needs to stop showing off her papers about murder. Let's hope she doesn't have more than one. One thing I didn't notice upon the return was that Charlotte was holding one of Ali's flowers. That's about the only clue we have right now. Liam actually seems like a nice enough dude for Aria, right? 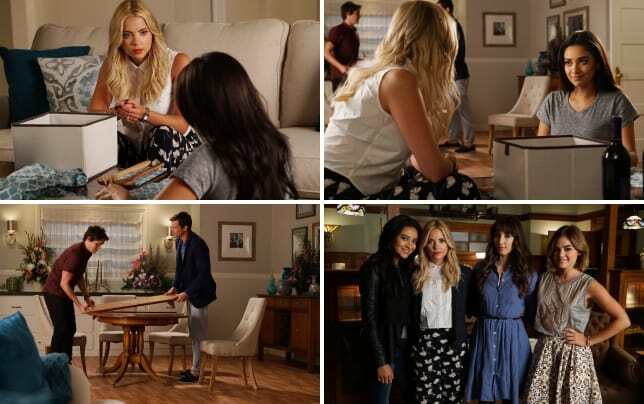 Remember you can watch Pretty Little Liars online, right here on TV Fanatic. Get caught up on this addictive drama right now. What did you think of the episode? What's your killer theory? Is Spaleb really a thing? Hit the comments below and be with us next Tuesday to run down Pretty Little Liars Season 6 Episode 13.